Revenue cycle management (RCM) and compliance are two sides of the same coin. Identifying and managing risks from both sides ensures better outcomes, while reducing the cost of auditing. In nearly all cases, the data needed to analyze compliance risks is the same data used for uncovering coding and billing issues on the RCM side. For example, focusing on risks in the area of charges can eliminate duplicate charges that can lead to compliance penalties, while also solving the problem of uncovering missed charges that leads to reduced revenue. Joint management of claims can reduce over-payments that pose a compliance risk, while minimizing denials that plague the RCM team. The realization that both groups can benefit from a combined effort should lead to a new strategic direction. Instead of focusing on the two areas separately, it is more effective to find and initiate corrective action on high risk areas, regardless of where they exist. Tightened budgets have forced both compliance and RCM groups to operate with fewer resources, even while demands on both groups continue to increase. Compliance teams are faced with a growing number of regulatory requirements as the healthcare industry transitions to value-based care models. And as reimbursements shrink, RCM groups must make sure they are identifying, capturing and collecting on every legitimate service your organization is providing. These new challenges greatly increase the need for auditing and monitoring - for both compliance and RCM departments. Combining the resources of the two groups under a single revenue integrity umbrella is a logical move, since both are performing similar tasks and mining the same pool of data. Leveraging the expertise of the combined teams makes both financial and operational sense. More data is available now than ever before, so conducting the type of deep dive analysis that will yield actionable results requires the use of a robust analytics solution. Both the compliance and RCM teams must use this type of tool to quickly uncover trends and drill down to the detailed data that affects both areas. A comprehensive analytics dashboard allows you to review billing data to identify basic errors and pattern changes. It also provides the ability to deeply mine the data to identify the sources of issues - whether they be coders, physicians, new service lines or documentation issues with the EHR. A common analytics software tool helps break down audit silos by providing a single "risk repository." It also benefits both compliance and RCM groups by laying out an optimal assessment schedule, coordinating with third party auditing entities, uncovering trends and identifying outliers. Combining the efforts of both teams under a unified revenue integrity program provides another key benefit by allowing compliance and RCM to share their audit tools. The use of Governance, Risk, and Compliance (GRC) software on the compliance side is enhanced when combined with the deep-dive analytics and automated audit workflow capabilities of applications employed by the RCM team. Continuous monitoring is a fundamental component of an RCM sampling audit plan, and provides significant advantages for the compliance group as well. Both teams benefit by moving from a traditional, periodic-based auditing process to one that uses in-depth analytics to focus on identifying and correcting high-risk issues. 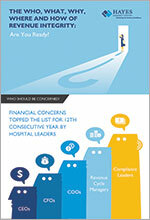 Both compliance and RCM share a common goal of maintaining the financial viability of your organization. Compliance strives to minimize issues that could result in costly reimbursement paybacks or penalties. RCM focuses on optimizing the entire revenue stream - from front-end patient engagement, through the mid- cycle revenue recognition, to back-end collections. An ongoing partnership between the RCM and compliance teams - connected by these common goals -results in more in-depth, relevant information flowing between both groups. This increases effectiveness and efficiency, since the exchange of information helps better target risk areas. Having a close working relationship between the two teams also improves communication throughout the organization. Outcomes can be relayed more frequently to both senior management and the board. Compliance metrics can be summarized consistently and provided in graphical format so that executives can digest the results quickly and formulate action plans when needed. This enhances accountability with all stakeholders and encourages everyone to be more actively engaged in partnering to solve common problems facing the organization. 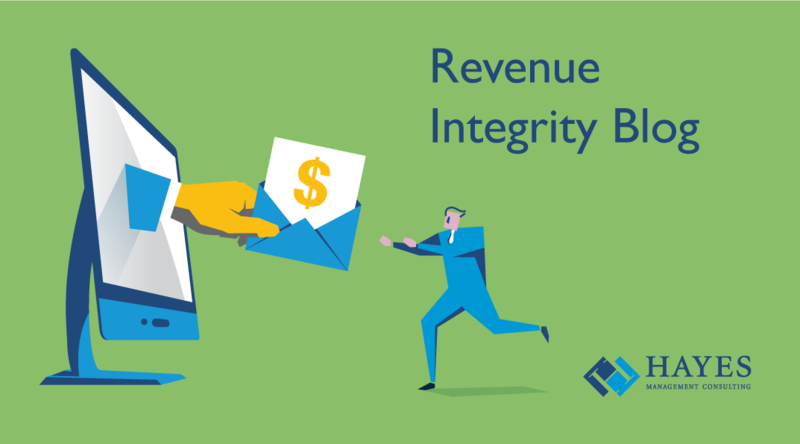 Building a strong revenue integrity "backbone" that unites the compliance and RCM teams can exponentially increase the ability of each group to reach their goals. Breaking down departmental silos and focusing on a global revenue integrity program that underpins both disciplines can significantly improve the financial well-being of your organization. For more information on revenue integrity, feel free to download our infographic, The Who, What, Why, Where and How of Revenue Integrity - Are You Ready?